The verandah, the social center of the inn, overlooks the courtyard. Each of the 15 guest rooms at the inn offer a tranquil, romantic, elegant choice for Amelia Island lodging where you can be transported to a world of luxury. You can browse their website (addisononamelia.com) to chose the room that will be just right for your visit. The innkeepers pay attention to every detail to make your stay the most enjoyable ever! The Addison’s breakfast service uses the freshest possible ingredients in the meals that they provide for their guests. They present fresh fruit at breakfast, do all of their baking in-house, and use herbs from their garden in food preparation. Come hungry… there is no skimping on breakfast here. The first morning was a fresh fruit parfait followed by croissant French toast, sausage, and a egg-quiche muffin. The second morning we were served the most delicious pineapple tart (they even share recipes) and a ham, egg, and cheese panini garnished with fresh spinach and tomatoes. They squeeze their own fresh orange juice every morning. The color of the juice is brilliant and the taste is amazing. Another first class touch. Happy Hour is no different when it comes to upscale. They make their own hummus, bruschetta, and guacamole just minutes before serving it. The baked brie in pastry was ‘to die for’ and they offer a nice selection of beer and wine to enjoy with it. 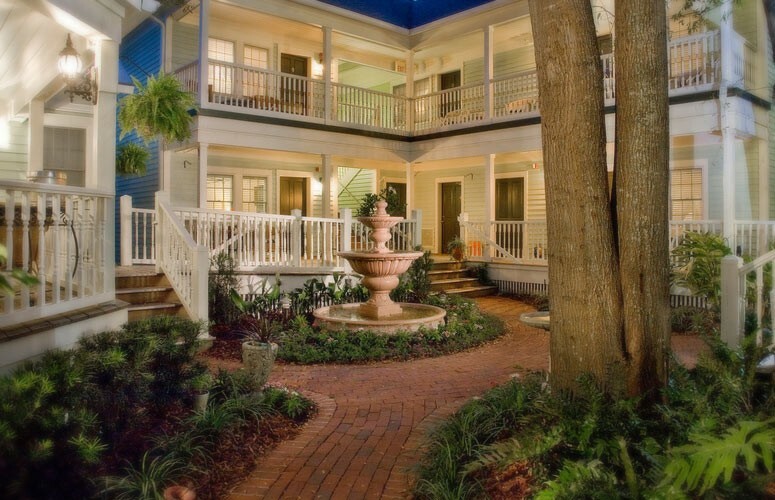 Conveniently located in the charming Historic District of Fernandina Beach the inn is just a short stroll to shopping, great restaurants, eclectic art galleries, and the marina. There is something for everyone including a day at the spa, eco- tours of the rivers and marshes, shopping, skippered sailing cruises, fine dining and casual lunches, and the Farmer’s Market every Saturday. If all this first class attention doesn’t convince you that they go above and beyond… the crowning touch was when a diamond necklace was left in our room and Shannon called to report that the maid had turned it in. No problem … she mailed it back to us right away! So start planning your great escape… you’ll love it. Be sure to say hello to Bob and Shannon and tell them Seniors Today sent you! The Addison on Amelia Island is located at 614 Ash Street, Amelia Island, Florida, 32034. Phone: 1.904.277.1604.